An epic fantasy exploring themes of conflict, loyalty and religious faith. Vaelin Al Sorna, Brother of the Sixth Order, has been trained from childhood to fight and kill in service to the Faith. He has earned many names and almost as many scars, acquiring an ugly dog and a bad-tempered horse in the process. Ensnared in an unjust war by a king possessed of either madness or genius, Vaelin seeks to answer the question that will decide the fate of the Realm: …who is the one who waits? Blood Song is the first volume of Raven's Shadow - a new epic fantasy of war, intrigue and tested faith. Vaelin's father was Battle Lord to King Janus, ruler of the unified realm. Vaelin's rage at being deprived of his birthright and dropped at the doorstep of the Sixth Order like a foundling knows no bounds. He cherishes the memory of his mother, and what he will come to learn of her at the Order will confound him. His father, too, has motives that Vaelin will come to understand. But one truth overpowers all the rest: Vaelin Al Sorna is destined for a future he has yet to comprehend. A future that will alter not only the realm, but the world. Vaelin Al Sorna was only a child of ten when his father left him at the iron gate of the Sixth Order. The Brothers of the Sixth Order are devoted to battle, and Vaelin will be trained and hardened to the austere, celibate, and dangerous life of a Warrior of the Faith. He has no family now save the Order. Vaelin’s father was Battle Lord to King Janus, ruler of the unified realm. Vaelin’s rage at being deprived of his birthright and dropped at the doorstep of the Sixth Order like a foundling knows no bounds. He cherishes the memory of his mother, and what he will come to learn of her at the Order will confound him. His father, too, has motives that Vaelin will come to understand. But one truth overpowers all the rest: Vaelin Al Sorna is destined for a future he has yet to comprehend. A future that will alter not only the realm, but the world. From ?a new master storyteller” comes the beginning of an epic fantasy saga of blood, honor, and destiny? After fighting back from the brink of death, Queen Lyrna is determined to repel the invading Volarian army and regain the independence of the Unified Realm. Except, to accomplish her goals, she must do more than rally her loyal supporters. She must align herself with forces she once found repugnant—those who possess the strange and varied gifts of the Dark—and take the war to her enemy’s doorstep. But not many know the truth: that the lines of drakes are weakening. If they fail, war with the neighbouring Corvantine Empire will follow swiftly. The Syndicate’s last hope resides in whispers of the existence of another breed of drake, far more powerful than the rest, and the few who have been chosen by fate to seek it. 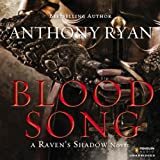 In Blood Song, Anthony Ryan introduced readers to ?a fascinating world of conflicting religions and the wars fought in the name of those faiths” (Library Journal). Now Ryan’s epic tale continues as Vaelin Al Sorna discovers that there is no escape from the call of destiny?